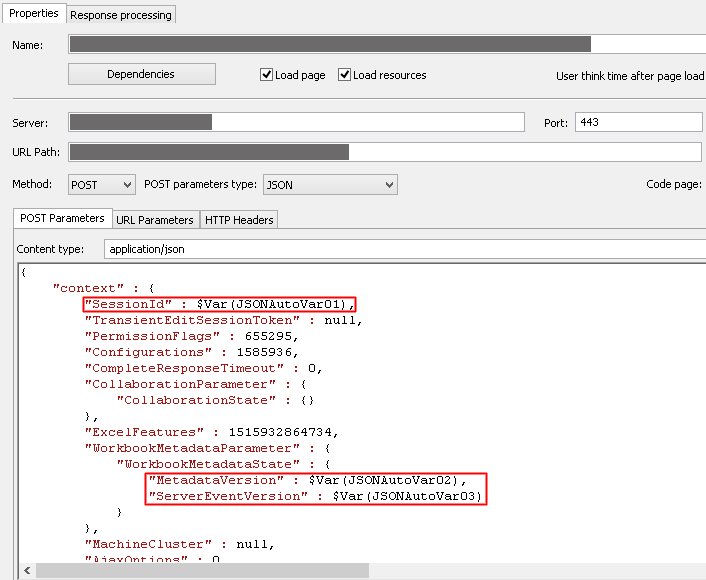 With the installed module, WAPT can find session-specific values in JSON messages received from the server and automatically parameterize them. If during recording WAPT finds a session-specific value in a JSON message, it creates a special variable named JSONAutoVar01 (JSONAutoVar02 and so on). These variables are calculated using JPath function which extracts the value from the message by its path. After that WAPT inserts these variables in all subsequent requests instead of the original values. Created variable is inserted in all subsequent requests instead of the originally recorded value of SessionId. In each new session WAPT will use a new value of SessionId received from the server. For other session-specific values WAPT creates JSONAutoVar02 and JSONAutoVar03 variables. Their values will be also taken from server responses in each new session. In this way WAPT performs the automatic parameterization of session-specific values in JSON messages.